Shaheen Shawaheen and his students stand around a waist-high wooden table. They use handheld metal nippers with sharp tempered jaws to cut ½ inch square tiles called tesserae from bars of granite approximately ¼ inches thick. With strong hands and careful attention to detail the artists snip away bits of each nugget until they fit into their designated spot. When the piece is ready they brush on a generous coating of paste. They use tweezers to place it face down on a bolt of cotton fabric stretched tightly over the table. The mosaic will take the team of three workers a week of eight-hour days to complete. Shaheen works at the Madaba Institute for Mosaic Art and Restoration, the only school in the Middle East offering a degree in the preservation and conservation of mosaic art. Twenty three years ago Shaheen enrolled at the institute because he wanted to learn an interesting and useful vocation. 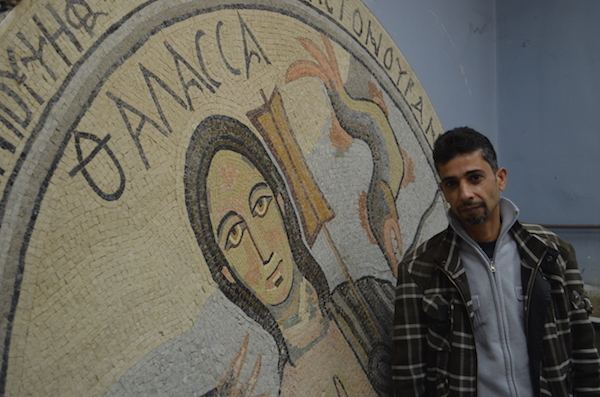 He is now an instructor here and has helped restore some of Jordan’s ancient mosaics. Shaheen is a thin, wiry man in his early 40s. His dark eyes and graying goatee and temples give him a professorial air. But his garb–brown boots, blue jeans, plaid fleece jacket–are more suited for fieldwork than the lecture hall. Shaheen is more interested in accuracy than speed. Speaking in English, his second language, he pauses frequently, feeling for the precise word. His hands are hard and calloused from years of working with rough material but they are steady, too. Replacing tesserae, like other stone artistry, requires a dichotomous balance of strength and subtlety. Madaba is called the “City of Mosaics” because of the many Roman, Byzantine, and Umayyad mosaics discovered in the municipality and surrounding area. Located twenty miles south of Amman, this city of 60,000 people is the capital of the Madaba Governorate. It is a city where Muslims and Christians take pride in being tolerant of each other’s faith and traditions. People have been decorating their floors and walls using small pieces of tile and stone for more than 4,000 years. Some of the earliest mosaics, made from terra cotta, date back to Mesopotamian civilization. Around the fourth century BC the Greeks began using stones and tiles to create precise geometric patterns and scenes of people and animals. By employing smaller tesserae and introducing more color artists were able to imitate paintings. Mosaic art grew in popularity with the expansion of the Roman Empire. Romans decorated their floors with colorful mosaics celebrating their gods and depicting scenes from everyday life. In the fifth century AD, Byzantine Christians began decorating their walls and ceilings using tiles and colorful glass that would reflect or refract light. They also introduced Christian themes to their art. With the rise of Islam in the sixth century, mosaic art transitioned from representations of human forms to pictures that were more geometric and abstract. Many Muslims believed art depicting humans should be forbidden because man was created in the image of God. Madaba has been inhabited for more than 3,500 years. The city was destroyed by an earthquake in the eighth century AD and Madaba’s great artistic heritage was forgotten until the nineteenth century when a group of Christians resettled the area. At the time Ottomans controlled the region and forbid the construction of new churches. But in an act of tolerance they allowed Christians to build on sites where previous churches hand existed. 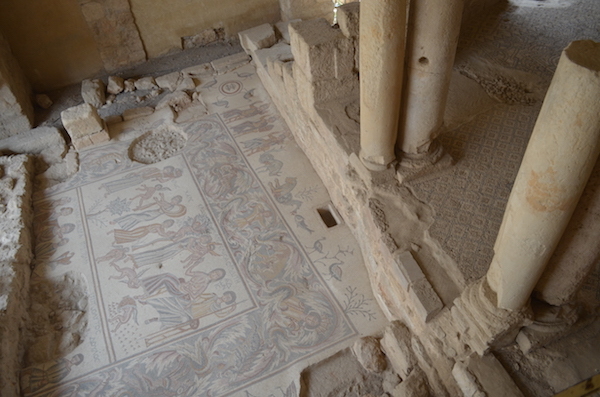 Madaba’s ancient mosaics were rediscovered by construction workers digging at the old church sites. In 1884, while workers were clearing ground for the Greek Orthodox Church of Saint George, they uncovered a mosaic that has come to be known as the Madaba Map. Dating to the sixth century AD, the 16’ x 52’ map was originally part of a much larger floor design. The map has more than two million tesserae of various colors including black, white, brown, blue, red, orange, and green. The map is the world’s oldest cartographic depiction of the Holy Land and continues to be used by modern scholars to verify the location of biblical sites. When a mosaic is discovered the first thing Shaheen does is to document every detail of the picture. Then, if the institute can purchase the site, Shaheen’s team will begin to restore the mosaic right where it lays. If they have to remove the mosaic they take it up in sections and transport it to the institute for restoration. Shaheen says they must clean each square inch of the picture and use chemicals to restore the original colors. They do historical research and study examples of other mosaics to better estimate color and design. The institute utilizes direct and indirect restoration methods. With the direct method, they replace broken or missing tesserae with pieces matching the color and composition of the old stones. It takes a trained eye to put a new piece alongside one that’s over a thousand years old. The ancient artists used lime as the bonding agent so when Shaheen and his team restore a mosaic they use the same type of plaster. The indirect method, on the other hand, involves creating an exact replica of the old mosaic. Current students and technicians trained by the institute take pictures and write down details of every component on the old picture. Using computers, they make their best estimates of what the mosaic should look like in its repaired state. Next they transfer the design of the picture to a large piece of fabric stretched across a flat wooden table. Then they find materials that match those used by the original artist (granite, marble, glass etc.). One by one the pieces are shaped and glued face down to the fabric with a water soluble paste. When all the pieces are in place the artists spread a layer of cement over the pieces to bond them together. After the cement dries they flip the picture over and soak the fabric in water to dissolve the glue and remove the fabric that was protecting the face of the mosaic. Shaheen says he prefers the indirect method to the direct method because it is easier and looks better when the project is finished. Across from the crypts, housed in a metal building are the ruins of the Church of the Virgin Mary. The church, which dates from the late sixth century, has mosaics from Roman, Byzantine, and Umayyad periods. On the east end of the church there is a circular 96-square meter mosaic with geometric patterns from Islamic tradition that also contains a dedicatory inscription to the Virgin Mary. In the Western section of the church archaeologists discovered an older 31’ x 24’ mosaic depicting scenes from a Greek tragedy about the life of Hippolytus, a horseman who was killed by a sea monster after he rejected the sexual advances of his stepmother, Phaedra. The institute was established in 1992 as a school to provide vocational training for high school students. In 2006 the ministry of Tourism and Antiquities, the Department of Antiquities, the Jordan Tourism Development Project, USAID, and the Italian Government collaborated to upgrade the school to an institute. Amjad said the institute now offers 72 credit hours of course work in chemistry, history, computer science, archaeology, techniques in documentation, and techniques in restoration, excavation, drawing, and English. Graduates can transfer credits to Al Balqa University, where they can earn a bachelor’s degree. Students are allowed to pay back the cost of their education by doing restoration work. 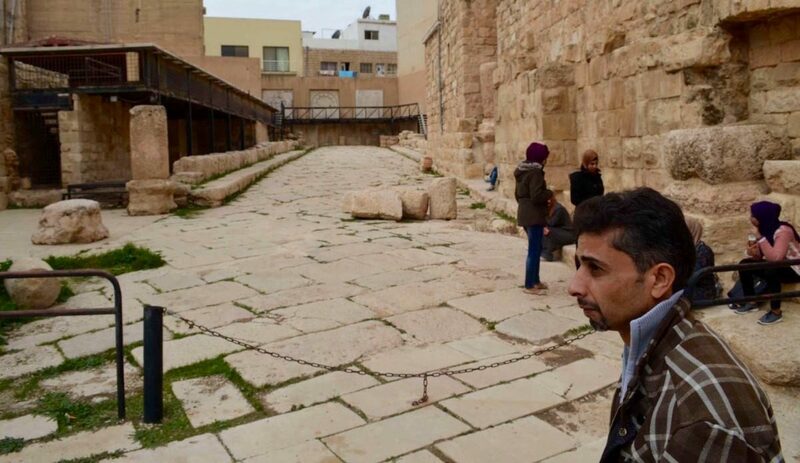 Many of the former students remain in Madaba where they find work in restoration or open shops to sell their art to tourists. Unfortunately the recent fighting in countries surrounding Jordan has stifled tourism and as a result shops that sell mosaics are suffering financially. Danny Wright lives and writes in Jordan.